The NIH COBRE in Biomolecular Structure and Dynamics supports researchers who conduct interdisciplinary research in the biomedical sciences that incorporate biophysical and molecular-structural approaches. Letters of intent are due on December 3, 2018 and, if invited to apply, application due date is March 15, 2019. 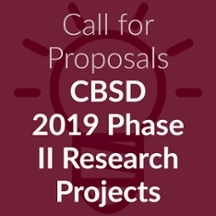 Funding for two CBSD COBRE project investigators will become available on August 1, 2019. CBSD COBRE Research project grants will provide $150K per annum in direct costs for up to two years. Applications must describe a research project that fits well with the scientific theme of the CBSD. This competition is open to all full time faculty members at the University of Montana. New and Early-stage investigators are encouraged to apply*. * A junior investigator is defined as a new investigator or early-career investigator who does not have, or has not previously had external, peer-reviewed Research Project Grant (RPG) or Program Project Grant (PPG) support from either Federal or non-Federal sources for which the individual is named as the PD/PI (see https://grants.nih.gov/policy/new_investigators/index.htm for a complete definitions of “new” and “early career” investigator). A PI may have held R03, R15, R21, R00, training or mentored-career award (including NSF CAREER), and retain status as a new investigator.